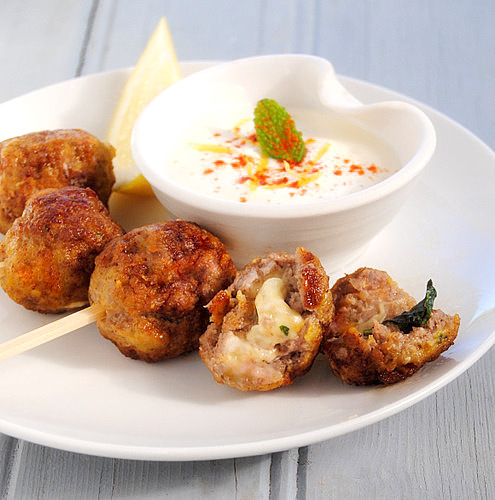 Everyone loves a frikkie, or a kofta, or whatever name you give to this delicious, much-loved South African snack. A melting nugget of feta cheese wrapped in fresh mint is the surprise inside these lightly spiced meatballs. Frikkies are a very important component of padkos. This is an Afrikaans word that is impossible to translate, although its literal meaning is 'road food'. But padkos is so much more than just food for the road. Most often, you'll take padkos in the car with you on a long trip, but you can also use the word to describe any food you'd take to eat on the hoof. Or on a plane, or a train. I have fond memories of the long train trips I used to take when I was a student at Rhodes University in the early 1980s. The final leg of the journey involved changing trains at Alicedale, a small railway town in the Eastern Cape. The train that used to run between Alicedale and Grahamstown was pulled by an ancient Puffing Billy that toiled so slowly up the hills that you could hop off and jog alongside the train without any fear of being left behind. On one occasion, half starved, having spent all my pocket money the previous day, I was delighted to see the auntie sitting in the seat opposite me hauling out a big, battered polystyrene cooler box. She and her daughter, who both looked like overstuffed sofas in their floral crimplene dresses, carefully unpacked a wonderful assortment of padkos, including chilled grapes, sandwiches, vetkoek, lemonade and big plastic blikkie [box] lined with foil and filled to the brim with juicy-looking frikkadels. Then, without so much as offering me a taste, they methodically demolished the lot, dolefully chewing on their meatballs all the way to Grahamstown, their bovine eyes fixed on a point six inches above my head. I asked my friends on Twitter to help me define #padkos. The best suggestion, from @NixDodd, was, 'The refreshing victuals packed to sustain travellers on the long South African roads." Spot on: 'victuals' is an excellent word for describing this sort of food. And what, I asked Twitter, constitutes proper padkos? There are too many victuals to list here, but the most popular items included hard-boiled eggs (with salt in a twist of foil), egg- or chicken-mayonnaise sandwiches, frikkadels, biltong, cold boerewors, pork sausages, crisps, rusks, samoosas, naartjies, moerkoffie in a flask (preferably sweetened with condensed milk), toffees, sweets and cold chicken drumsticks. All these suggestions were tweeted with great fondness and nostalgia, revealing just how important a part padkos plays in South Africa's culinary heritage. If you're still not convinced by the idea of cold meatballs, try my special formula (although you may want to leave out the cheese if they're going to be eaten on the road). You can make these with minced lamb, beef, or pork or – best of all – a combination of beef and pork. Prepare the raw frikkadels up to 12 hours ahead and keep them covered in the fridge. These need to be fried and then finished off in the oven, or they will darken in the pan before they’re cooked right through. The chickpea and spice dusting helps to create a rich golden crust. Chickpea flour is available from health shops and spice shops. But you can, of course, use ordinary flour. Whisk the egg and yoghurt in a large mixing bowl, stir in the breadcrumbs and allow to stand for 5 minutes. Now add the mince, onion, garlic, coriander, lemon zest, spices, salt and black pepper to taste. Using your hands, squish everything together to make a fairly firm paste. To form the meatballs, pinch off a ball the size of a large litchi. Slightly flatten it in the palm of your hand, place a mint leaf on top, and on top of that a cube of feta. Gently squeeze and pinch the mixture to fully enclose the filling then roll it, very gently, between your palms to form a ball. Put them in the fridge for 30 minutes to firm up. Heat the oven to 180º C. Mix the chickpea flour, turmeric and paprika together a plate and season to taste with salt and pepper. Roll the meatballs, eight at a time, in the seasoned flour and dust off the excess. Fry in hot oil, in batches, for 3-4 minutes, or until crusty and golden brown all over, draining on kitchen paper. Place the meatballs on a baking sheet and roast in the hot oven for 5-7 minutes, or until cooked right through. Stick a toothpick into each one and serve hot or cold, with Lemon-Yoghurt Dipping Sauce. I've said it before, say it again...SA food is the next great undiscovered cuisine...love this dish. Bring some more! I love the feta and mint on the inside and the dusting of chickpea flour on the outside. Yummeee! Love the idea of cheese inside, a bit like the Italian meatballs with mozzarella hidden inside that I used to love in Rome, so long ago I've forgotten their name. I have to admit to being seriously deficient in the packing of padkos for our journeys. Mostly because packing for the destination is always so hectic that cooking something specially for the trip would be the last straw. But next time I want to be supermum, I'll be straight back for this recipe - cold meatballs would be ideal. I absolutely love this post - I cannot help but feel so patriotic! Can only imagine how tough that train ride must have been...but am in stitches of your description of the ladies as "overstuffed couches"! Every school holiday, we'd make the journey to our grandparents at the Breede River - and our padkos always consisted of egg-mayo sarmies, rusks, cookies (from Compass Bakery), tea and coffee from the flask, and some MacTavish Butterscotch sweeties. Your frikkies look - and sound - addictive. Definitely trying the hidden cheese next time! I love love love that filling! Very clever Ms Hobbs, very clever indeed.